Patience only can last so long. The big takeaway from yesterday’s rollout of proposed federal rules is that pretty much everyone has gotten tired of waiting for the healthcare industry to get its data exchange act together. For years now, patients and their families waited. Consumers waited. The federal government waited. Insurers waited. And even providers and vendors waited. There’s been limited success with making interoperability ubiquitous and seamless. The fact is, moving healthcare information around is still hard work, and for reasons that go beyond the technical. It’s no wonder, then, that data exchange and healthcare information accessibility rules that the federal government proposed yesterday now lay down the law for what will be expected of the industry in the future. 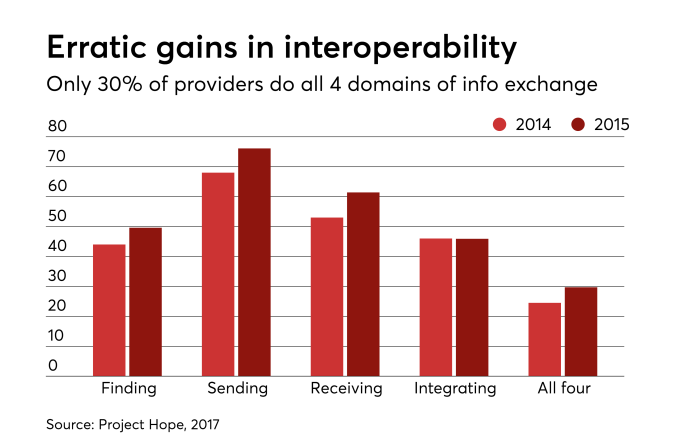 Federal agencies have been cajoling the industry for years, pushing for it to make progress on interoperability. Three years ago in Las Vegas, then HHS Secretary Sylvia Burwell gave the keynote at the HIMSS annual conference, announcing the agency had cobbled together commitments from about 15 major EHR vendors, 16 healthcare provider organizations and 16 of the nation’s largest and most influential provider, technology and consumer organizations to finally jump start information sharing initiatives. Perhaps you’ve forgotten that big splash at HIMSS16. Or the fact that interoperability goals were included in the meaningful use incentive program. Or that the Centers for Medicare and Medicaid Services stated its intent last year to rename the meaningful use program to “Promoting Interoperability.” Or that Congress overwhelmingly passed the 21st Century CURES Act with provisions that directly hit against information blocking efforts (that’s the mean way of saying inability to interoperate). This couldn’t have been any clearer than the multiplicity of signs at the Orlando International Airport telling you where to stand or where to walk on motorized walkways. Healthcare has generally lagged other industries in adopting technology, and that’s particularly true of technology that’s enabled consumers to interact with or take control of their healthcare information. That fact is foundational to the proposed rules, says Donald Rucker, MD, National Coordinator for Health IT. Beyond such information transparency is price transparency, and that’s another area that federal agencies expect to seek progress, Rucker says. There are multiple reasons why the time for information sharing has come. Reimbursement changes, primarily value-based care and population health management, work best when information is shared, helping diverse providers better coordinate care. And those crazy consumers, they think that just because they spend thousands of dollars a year on healthcare, they should be able to access their information—the nerve. And the federal government has signaled that it’s tired of waiting for the healthcare industry to get its act together on this. Friendly nudging will now be replaced by forceful shoving, and lack of compliance will no longer be tolerated. Federal agencies have waited for the industry to lead aggressively to solve problems that are not complex technologically but a veritable quagmire of competitive, behavioral and corporate obstruction. No more. The federal government now casts itself as the prime motivator to force the healthcare industry to play nice with its partners and consumers. No one likes to be told what to do, but that’s where the industry finds itself on February 12. Make it work, my friends.